These patriotic Washington DC souvenir musical snow globes are a perfect gift for any collector and look great in any office or room in your home. 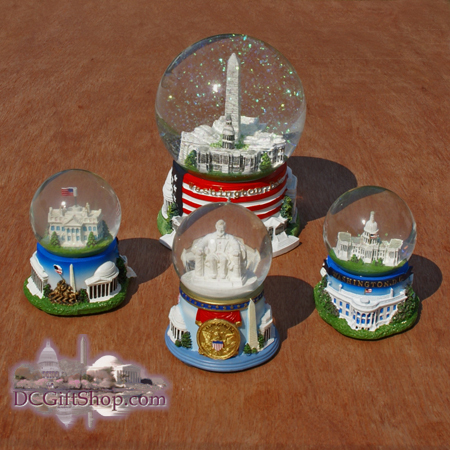 The Washington DC musical snow globe set showcases every major landmark in our Nation's Capitol and are a great collector's item for anyone living in the District and make the perfect Washington DC souvenir for anyone visiting for work or pleasure. The Washington DC souvenir musical snow globe set includes four patriotic snow globes; The White House, U.S. Capitol Building, Lincoln Memorial, and the large Washington DC musical snow globe at a significantly reduced price. Each Washington DC musical snow globe featured in the set comes in its own box for protection when shipped and are ready to play as soon as they arrive at your doorstep.